There are so many places in the world that I would love to visit. There are also so many experiences I’d love to, well, experience. While I would love to be one of those people that could quit their job and see the whole world I know realistically that I would never do that. So instead I have decided to narrow down my must see places to make my Travel Bucket List – due to begin completing sometime soon [insert hopeful face]. A few years ago I had the opportunity to see the Northern Lights when I went to Iceland. As luck would have it, it was not meant to be as the sky was too cloudy. 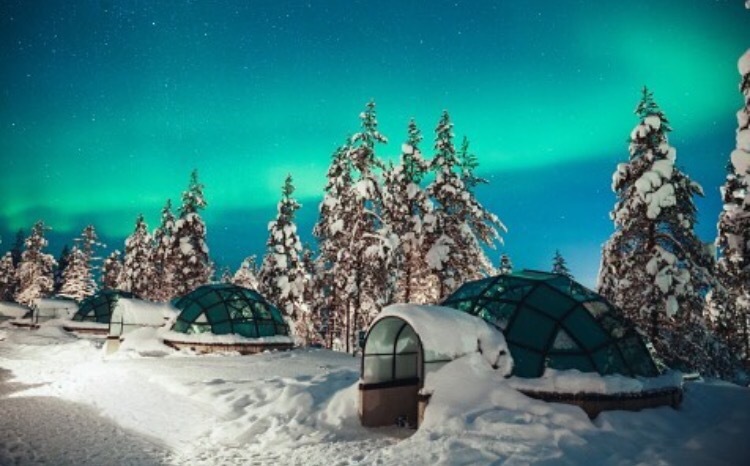 Disappointed was an understatement… until I discovered Kakslauttanen and suddenly my desire to see the Northern Lights was heightened but only if I could see them at this resort. Imagine it being the middle of winter, snow is covering the floor as far as the eye can see. Temperatures are below zero but you’re as snug as a bug in a rug. Heaven. The igloos at Kakslauttanen are my heaven. I love the winter, I love it being too cold that you have to wrap yourself up in as many layers as possible. The idea of being in one of the igloos, being able to see the cold, be right in the middle of it, without feeling it is a dream. And to then be able to enjoy the majestic dance that is the Northern Lights is just the cherry on the cake. While I haven’t booked myself an igloo just yet it has to be pretty much at the top of my Travel Bucket List and it should be on everyone else’s! There is a snow Hotel inside this and much more. You can even get married inside snow chapel, as many have done. I prefer February for a visit. Have You met Santa? Here You can meet him even in summer. Worth for a visit round the year. Would You love to participate in a reindeer-driving contest? In mid-February.